Set your BS detector to ‘high’. The vitamin C story has all kinds of loose ends that do not lead back to actual science. Lots of arm-waving, snake oil, pie-in-the-sky crapola. Online articles are largely thoughtless repeats of ‘he said/she said’ propaganda. Ready for some clarity? Here is what I have found so far. GEEK ALERT: Parts of this article may be a little nerdy or technical. Whenever you see a little jargon or (EGAD!) chemistry, just plow through it or skip ahead to my main points. I think it is crucial for you to understand the issues laid out here and take appropriate action for your own benefit. Let’s backtrack for a moment, to the 1937 Nobel Prize in Physiology or Medicine that was awarded to Albert Szent-Gyorgyi. These processes subsequently became known as the part of cellular respiration (“biological combustion”) that we now call the Krebs Cycle. Okay, that’s getting a little nerdy, I know. The point is that it was NOT for the discovery of vitamin C. What the Nobel summary was referring to is the structural determination of a hexuronic acid, which we now call ascorbic acid. It is so named because it was originally believed to be the active ingredient that prevents and reverses scurvy. The name “ascorbic acid” derives from a- (anti-) scorbic (scurvy) acid. has long been viewed as due to the vitamin C content of such foods. Jump forward to 1936, when Szent-Gyorgyi seemed to recant his earlier notion of ascorbic acid as vitamin C. You can see his original article in its entirety (less than a page!) here: Vitamin P: Flavonols as Vitamins (Nature, 1936). In other words, ascorbic acid was not the end-all and be-all for eliminating the earliest consequences of scurvy (i.e., capillary damage). TRANSLATION: Ascorbic acid is not the anti-scurvy vitamin. Szent-Gyorgyi instead attributed successful treatments with extracts from whole foods: red pepper or lemon. The key cofactors were flavonoids – YAY! – which he called vitamin P.
Is ascorbic acid the same thing as vitamin C? Obviously not. Is vitamin P the active anti-scorbutic factor? Not by itself. Are these ingredients important in combination? Absolutely! If you never heard of vitamin P, that may be because it fell out of favor as a vitamin. It is not a single substance, anyway. It is comprised of multiple flavonoids. Research to date has discovered about 4,500 kinds of flavonoids in the plant kingdom. KEY POINT: Plants produce ascorbic acid AND flavonoids together, with few exceptions. Now the confusion really heats up. If we conclude that ascorbic acid and vitamin C are not the same thing, then exactly what is vitamin C? Commentary on this topic is all over the map. Lots of arm-waving, teeth gnashing, wild-eyed opinion, rumor, and overall confusion. At some point the concept of a “vitamin C complex” has appeared. Tracking down what that means has proven to be a tall task. I haven’t found any solid original research on the topic. Ascorbic acid and P factors are clear. K factors probably refer to vitamin K. I could not find a clear explanation for J factors. Tyrosinase is an enzyme that catalyzes the formation of melanin in the skin. It is copper-dependent, which sort of relates to the role of vitamin C and copper in the formation of collagen. Ascorbigen is currently defined as a molecule that combines ascorbic acid with a type of indole that is found in broccoli, cauliflower, cabbage, and related vegetables. In other words, ascorbigen is not widespread in plants – just certain types of veggies (i.e., “cole crops” in the plant family Brassicaceae). That covers broccoli and its brethren. What about red peppers and lemon juice? And what about the rest of the vitamin C-producing plant kingdom? It tuns out that many natural plant products have an ascorbyl unit (i.e., bound to an ascorbic acid moiety) attached to them. Such compounds are said to be naturally ascorbylated. This topic is the basis of an entire PhD dissertation at Oregon State University. The pertinent data are summarized in this journal article: Covalent interaction of ascorbic acid with natural products (Phytochemistry, 2009). Just two examples of naturally ascorbylated plant substances are actual ascorbigen and an ascorbyl-EGCG, shown below. Note that EGCG (epi-gallocatechin gallate) is a flavonoid derivative. This means that, in all likelihood, the “complex” that Szent-Gyorgyi referred to with vitamin P is in reality one or more ascorbylated flavonoids. The existence of many kinds of ascorbylated natural products leads me to think that vitamin C is not just one thing. Depending on which flavonoids and which other substances might be in any one plant, vitamin C might be thousands of different ascorbylated substances, spanning the entire plant kingdom. One more thing … ascorbic acid by itself is highly unstable when it is dissolved. Whenever it breaks off from its ‘host’ molecule, it isn’t going to last long. It immediately oxidizes to dehydroascorbic acid, thereby becoming an oxidant rather than the antioxidant it is supposed to be. What About Ascorbic Acid Supplements? Medical science and Monster Big Pharma have ignored Szent-Gyorgyi’s retraction for more than 80 years, because of convenience and money. Instead, they have launched a propaganda campaign – actually high-level brainwashing – to equate ascorbic acid with vitamin C. They have been very successful. Unfortunately, they have been wrong from the get-go. Commercial ascorbic acid is now synthesized cheaply and quickly from corn starch – i.e., a government subsidized GMO crop plant. Every single supplement that I have looked at that is supposed to contain “vitamin C” actually only contains synthetic ascorbic acid. 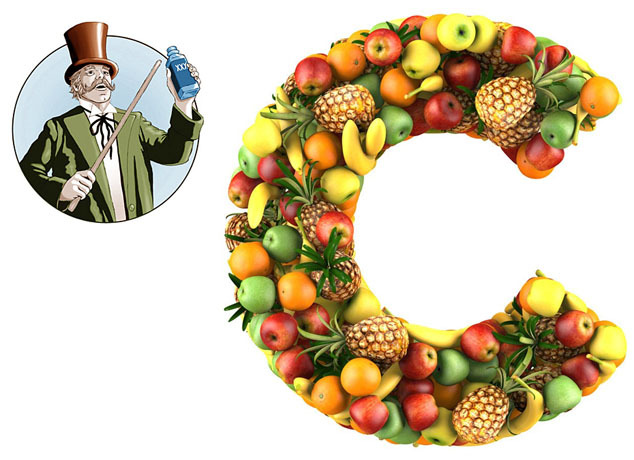 Clinicians, medical researchers, supplement users, and even Nobel Prize winners (e.g., Linus Pauling) have been completely taken in by this mainstream vitamin C propaganda. However, by accident, scientists have discovered that ascorbic acid alone does provide a few health benefits. Ascorbic acid works only in mitochondria. It acts as an antibiotic and anticancer substance for in its ability to influence the root cause of cancer – i.e., mitochondrial heteroplasmy that arises in part from defective proton recycling. Okay, I know I’ve stepped over the line with that scientific gobbleygook. My point is that ascorbic acid can be beneficial in a few limited ways. My perspective on vitamin C vs. ascorbic acid can explain the highly uneven research results on vitamin C that pervade studies going back decades. Routinely such studies purportedly have tested vitamin C, whereas in reality they only used synthetic ascorbic acid. For my money, I’d toss out all of it. The entire body of work is basically meaningless. Even so-called “whole-foods” supplements cannot possibly provide real vitamin C. Once any fresh plant material is processed, it destroys the vitamin C complex that it may have contained. The simple solution is to consume whole, fresh fruits and veggies. The fresher the better. Well, almost. The rampant overuse of agricultural chemicals is a growing danger to your health. “Preserved” citrus fruits, for example, are so heavily treated by synthetic chemicals that they have become the equivalent of “botanical Twinkies.” In other words, they never go bad. Comforting, isn’t it? Your best choice is to eat certified organic as much as you can. Of course, choosing the cleanest whole foods from among all the industrialized agricultural crapola in your local supermarket is the big challenge. That is a big, big topic that I will save for another day. Hi, Natalie…I hope in a GOOD way!